With AgencyIntelligence, gone are the days of having to go through multiple systems to attempt to analyze data. 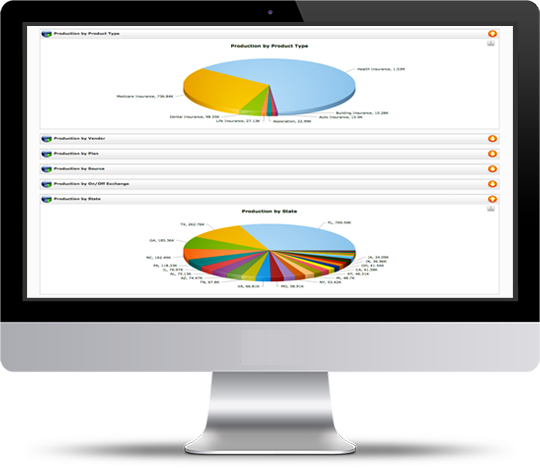 AgencyIntelligence provides the tools to track policies, manage commissions, documents, and agents with ease. Agencies can also process commissions for their agents and get licensing alerts directly. Your agents will keep track of their clients and applications; therefore generating new business easily with a seamless lead system. This agency management system does it all. AgencyIntelligence is more than just a simple CRM, it is the advanced technology of today will continue to give your agency a competitive edge long into the future. At Intruity, we believe that by staying on the cutting edge of technology, insurance agencies that utilize our products will advance and streamline their business while leaving their competitors in the technological obsolescence of the past. At Intruity Corporation, we strive to create software of the future. Our development staff regularly updates, modifies and maintains its cutting edge technology, while making customizations to accommodate client requests. Intruity Corporation prides itself with a staff of exceptional minds in the software development field who welcome the challenges of an ever-changing world.